As one of the top prospect names in baseball (and the hobby) over the last few years, the interest in Vladimir Guerrero Jr. cards continues to build as he makes his way through the minor leagues and, ultimately, to the majors. Just 16 when he signed as an international free agent with the Toronto Blue Jays in 2015, the Dominican outfielder has been a hot commodity with collectors nearly ever since then. While his Hall of Fame father, Vladimir Guerrero Sr., was an MLB legend with plenty of fans, collectors appear even more excited to see what Vlad Jr. can do. Although there were some earlier prospect options in 2015 Contenders and 2015 Elite Extra Edition, without any doubt, the key Vladimir Guerrero Jr. cards are found in 2016 Bowman and 2016 Bowman Chrome. His base paper / Chrome prospect card comes in the main Bowman Baseball release, while the 2016 Chrome Prospect Autograph card is part of the Bowman Chrome set. See also: Top Vladimir Guerrero Jr. Rookie Cards to Collect. This hard-signed card is the heavy favorite with collectors but the price is already quite high, especially the low-numbered parallels that sell for thousands of dollars. 2016 Bowman's Best has another top autograph from early in his career. Shop for high-end Vladimir Guerrero Jr. cards on eBay. There have been plenty of cards in recent years, as well, including multiple signed cards. The Vladimir Guerrero Jr. rookie cards are expected in 2019 baseball sets, but that won't happen until after he makes his official MLB debut. The guide below features the most-watched auction listings for Vladimir Guerrero Jr. cards. It is updated in real-time so check back regularly to track the hottest cards and current values for the budding Blue Jays superstar. 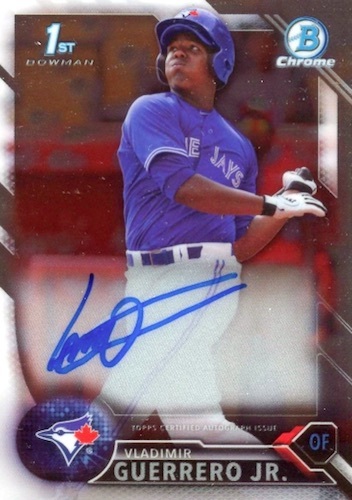 Click to see the Vladimir Guerrero Jr. card auctions with the most bids. Vladimir Guerrero Jr 2016 Bowman Chrome Blue Refractor RC AUTO BGS 9.5/10 HOT!!! Vladimir Guerrero Jr 2016 Bowman Chrome Blue Refractor RC AUTO /150 BGS 9.5! 2016 Bowman Chrome Prospect Vladimir Guerrero Jr Blue Refractor /150 BGS 9.5! 2016 Bowman Chrome Vladimir Guerrero Jr. RC PSA 10! Hot Card #1 Prospect! SWEET! 2016 Bowman Chrome Refractor Vladimir Guerrero Jr Auto #/500 - #1 Prospect!